Compac indicators are always repairable. It all depends on how many parts you are willing to replace. Your primary consideration should be: Can you get the spare parts? At one time, Compac had 48 models of test indicators. This was reduced by half as of this writing. Although the majority of parts are shared by all the models, you could end up looking for a part which no longer exists. Check to see that you are working on a model still in production. If not, then check carefully to see if parts will be available. In theory, any Brown & Sharpe distributor should be able to provide you with parts for current models. In practice, almost none of them will have parts in stock and they would have to send for them. This is time consuming and costly for them. Selling a $5 spare part can cost them many times that amount in shipping and processing fees. They may not want to co-operate. You should be prepared to place a substantial order to make it worth their while. Some websites, such as www.longislandindicator.com may offer parts for online purchase but you must also expect to pay more than published list price. If you can’t get parts, there is no sense in trying to repair a damaged Compac indicator yourself. Parts for Compac models made before the late 1960s are most certainly no longer available. Those models were usually sold under the name Alina, Lufkin or Parvus. 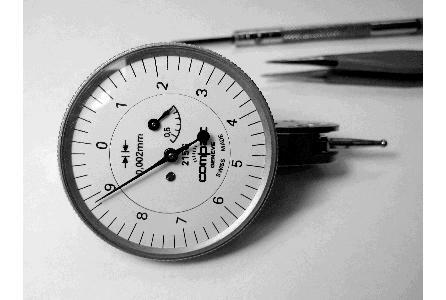 If you are not yet familiar with all the Compac models, their ranges, their dial diameters, their contact point sizes, their accuracies and current availability, take a close look at the information on the Long Island Indicator Service web page, the TESA catalog published by the manufacturer, or keep a copy of The Companion Reference Book on Dial and Test Indicators close to hand. Proper tools would have avoided this unsightly damage to the ball bearing and lock nut. The wrench shown is unfortunately not available for sale. Instead, a pair of fine nose jeweler's pliers should have been used to loosen the lock nut. For adjusting the ball bearing itself, you can modify a larger screw driver by filing away the center portion, leaving two tabs on either end to mimic the wrench. Would you like us to repair the indicator? Do you want information on new Compac indicators? Would you like to order a copy of the repair manual? The plastic dials of the 1960-1980s had a strange habit of turning purple around the printed lines and numbers. The ink must have bled onto the plastic somehow. This defect only appeared after several years of use and required replacement of the dial. For a brief period, Compac introduced attractively printed and sturdy metal dials in a dull silver metallic finish. This was the kind of dial we would expect from a country that produces such exquisite watches. They abandoned this dial after only a season or two. Perhaps it was hard on the eyes or too expensive. Subsequent white plastic dials were poorly printed often with broken tick marks and incomplete numbers. It was disgraceful and you will probably still encounter these. The current crop has much better print quality on bright white plastic. This is not without its problems, however. There is no longer a countersink for the dial screw which makes the little item stick up and above the surface like an amateur synchronized swimmer. The plastic also has a habit of warping over time and is very sensitive to some solvents. We assume that the manufacturer will eventually settle on a proper solution since they have been very successful with their problem free BesTest dials. Previous brass bushings in the movement have been replaced by six synthetic rubies reducing friction and wear.